If you haven't met Dory you are missing an experience! She is witty, she is funny, she is the annoying little sister we can't help but love! Move over, Junie B. Jones and Ivy & Bean! Here comes a lovably energetic little sister with a BIG personality—and an imagination to match! As the youngest in her family, Dory really wants attention, and more than anything she wants her brother and sister to play with her. But she’s too much of a baby for them, so she’s left to her own devices—including her wild imagination and untiring energy. 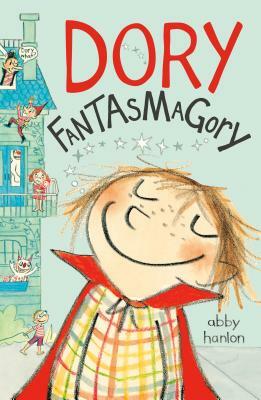 Her siblings may roll their eyes at her childish games, but Dory has lots of things to do: outsmarting the monsters all over the house, escaping from prison (aka time-out), and exacting revenge on her sister’s favorite doll. And when they really need her, daring Dory will prove her bravery, and finally get exactly what she has been looking for. With plenty of pictures bursting with charm and character, this hilarious book about an irresistible rascal is the new must-read for the chapter book set. Abby Hanlon is a former teacher. Inspired by her students’ storytelling, Abby began to write her own stories for children, and taught herself to draw. She is the author of Ralph Tells a Story. Abby lives in Brooklyn, New York, with her husband and their two children.